Security on the network that will host the Interstate Crosscheck Program this year is markedly improved from that of its previous host, according to a top security firm, and soon the Department of Homeland Security will lend its own expertise to hardening the network as part of its review of state election systems. Nevertheless, experts warn that the bolstered security may do little to fend off targeted cyberattacks. After weeks of testimony, Kansas lawmakers, both Republicans and Democrats, are even less convinced that Secretary of State Kris Kobach’s office is equipped to keep sensitive voter data from as many as 27 states out of malicious hackers’ hands. Fewer still are enthused about the prospect of the state being held financially liable should any of those records be compromised—again. The Crosscheck program, which rolls out at the start of each year and strives to identify possible double voter registrations, previously relied on a server maintained by the Arkansas Secretary of State’s office to send and receive sensitive voter data from more than two dozen states participating in the program. The records passed from Arkansas to Kobach’s office where the records were cross-checked for potential double voters. The results of Crosscheck’s analysis (the methodology of which has been disputed by academic research) were then transmitted back to Arkansas to be collected by participating states. Researchers at the Boston-based security firm Netragard concluded this week that the Kansas Secretary of State’s office was “far better protected” than its counterpart in Arkansas. But that assessment came with a number of caveats warning about the potential for yet another security misstep. Ultimately, the researchers found that infiltration of the larger Kansas government, by even a modestly proficient hacker, would be all but guaranteed. Essentially, Crosscheck’s ability to keep sensitive voter data from falling into the hands of novice hackers is inextricably tied to the architecture of its host (i.e., the State of Kansas). A single unsecured connection between the Secretary of State’s network and the other networks hosted by the state may pose an imminent threat to Crosscheck, Netragard found. As just one example, at the time of writing, Kansas was hosting two printers that both appear accessible by virtually anyone online. Neither is protected by a password. Even a seemingly innocuous device, such a printer, can serve as an entry point for a hacker dead bent on infiltrating a network. While declining to provide specifics, Kansas Director of Elections Bryan Caskey told Gizmodo on Wednesday that an “additional layer of security” exists between the Secretary of State’s office and every other state agency. “The state has their own firewall and their stuff and then we have another layer on top of that,” he said. “We only allow traffic between ourselves and other state agencies for very specific purposes.” The ongoing security review will be examining the way in which data is transmitted between the agency’s office and others, he added. How would an attacker get access to credentials to begin with?Despite offering better security than its Arkansas counterpart, the Kansas Secretary of State’s office “does not adhere to industry best practices based on what we could see in publicly available information,” Desautels said. At least not at present. For example, Netragard was able to identify what it believed to be VPN services using single-factor authentication rather than two-factor authentication. This means that if an attacker were able to get login credentials, they would likely be able to access the network without detection. From the outside, it’s difficult to say precisely how secure Kobach’s network currently is. Without permission, Netragard can only conduct what’s called “passive reconnaissance” on the network—meaning their research relies on services like Censys, DomainTools, Google, basic DNS enumeration, and the normal browsing of public-facing web pages. That is to say, while the researchers had high confidence a breach was achievable, their findings are limited to publicly available information. Scanning or testing the network any further without permission would be illegal. In reality, Netragard attempted no such hack, which is unnecessary to perform a surface-level security analysis; in fact, doing so would have been a felony. To be clear: There is no “scan” that can detect a data breach after it has occurred with any real degree of confidence. “If they did a vulnerability scan, there’s no chance in hell that they would detect a breach,” Desautels said. “When you’re ‘scanning’ for vulnerabilities, you’re looking for ways to breach systems; you’re not looking for evidence that systems have already been breached.” If a hacker does breach a system but fails to leave open any obvious ports or backdoors a “scan” is essentially worthless. Setting aside that years of Crosscheck data and passwords have been mistakenly exposed by human error—not hackers—the notion that the State of Kansas is equipped to detect a sophisticated breach seems, from a technical standpoint, unlikely. Kansas Rep. Brett Parker, a Democrat who serves on the state’s House Elections Committee, told Gizmodo that the Secretary of State’s office has failed in its repeated attempts to convince lawmakers that Crosscheck is truly secure. “They say they’ve never been breached, but what they mean is that they’ve never detected a breach, and the difference between those two should be concerning to us,” he said. A source with knowledge of lawmakers’ concerns told Gizmodo that Kansas Republicans have also voice skepticism about Crosscheck’s security. In public hearings, Republicans have repeatedly pressed Kobach’s office to respond to concerns about the financial liability they fear the state could face in the aftermath of a future data breach. Crosscheck’s 2018 rollout is already beset by fresh controversy: The leak of names, dates of birth, and partial Social Security numbers for nearly 1,000 Kansans. The data was transmitted to Florida, which that state’s government then unintentionally released in response to an open records request. 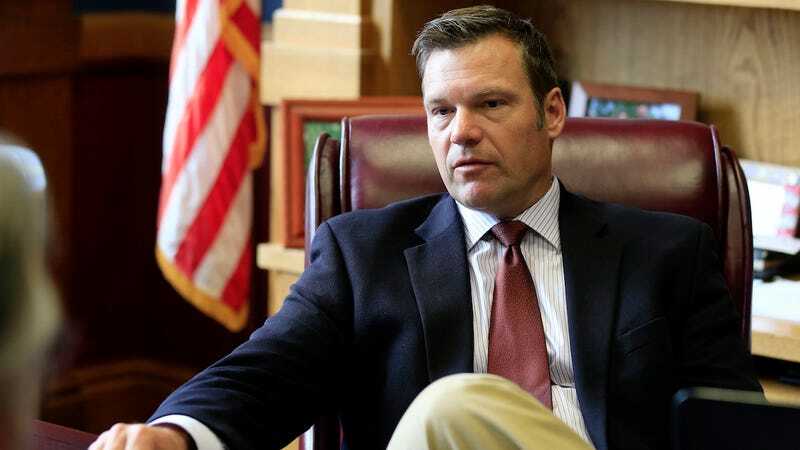 And the promise by the Kansas elections director that past mistakes will not be repeated seems starkly at odds with Kobach’s testimony at the Kansas statehouse two weeks ago: “First of all, I would note that I wouldn’t concede that there is a problem,” Kobach said. McClendon said he would replace the program with one offered by ERIC, the Electronic Registration Information Center, which currently has 23 participating states, only a handful fewer than Crosscheck. Its most recent additions are Missouri and Arizona, which joined the program in the past two months. McClendon said he had already spoken to the staff at ERIC, which uses a matching algorithm developed by Jeff Jonas, chief scientist of the IBM Entity Analytics Group, “which interestingly was the algorithm that I had looked at pretty heavily when I was at Google because we had all kinds of matching challenges with our local business data,” he said.